Billy Joe Thomas nació el 7 de agosto de 1942 en Hugo, Oklahoma pero se crió en Texas. En 1966 lanza su versión del clásico country "I'm So Lonesome I Could Cry", vendiendo más de un millón de copias, convirtiéndose en Disco de Oro. En 1968 llega "The Eyes of a New York Woman" y luego "Hooked on a Feeling" que fueron también éxitos. Un año más tarde, la canción "Raindrops Keep Falling on my Head" de Burt Bacharach, aparece en la banda sonora del filme "Butch Cassidy & The Sundance Kid", protagonizado por Paul Newman y Robert Redford y el tema gana el Oscar a Mejor Canción Original. Los éxitos continúan, entre ellos "I Just Can't Help Believin'", "No Love At All", "Mighty Clouds of Joy", "Rock and Roll Lullaby" y "Don't Worry, Baby". En 1975 llega al Nº1 en las listas country y pop con "(Hey, Won't You Play) Another Somebody Done Somebody Wrong Song" -la canción con el título más largo en las listas pop-. En los años 80 se vuelca más al género country logrando éxitos como "Whatever Happened to Old-fashioned Love", "New Looks From an Old Lover" y "Two Car Garage". También se encargó dell tema de la serie televisiva "Growing Pains", titulado "As Long As We Got Each Other". Escribió varios libros, incluida su autobiografía "Home Where I Belong" y protagonizó los filmes "Jory" y "Jake's Corner". El 3 de diciembre del 2013, la National Academy of Recording Arts and Sciences anunció que la canción "Raindrops Keep Falling on my Head" era incluida en el Salón de la Fama del Grammy. 1. AMCU - Usted ha logrado fama internacional pero ¿dónde diría que el público ha sido más receptivo a su música? B. J. Thomas - He sido muy afortunado de que todos los públicos han sido muy receptivos a mi música. Habiendo dicho eso, hay una energía en las audiencias sudamericanas que realmente disfruto y siempre paso muy bien cuando voy por allí. 2. AMCU - Su clásica "Gotas de lluvia sobre mi cabeza" (Raindrops Keep Falling On My Head) ha sido incluida en las bandas sonoras de "Butch Cassidy & The Sundance Kid" y "El Hombre Araña 2". La última introdujo la canción a una nueva generación. ¿Cuál es su reacción a esto? B. J. Thomas - Estoy muy contento por ello. "Raindrops Keep Falling on my Head" es la canción mejor escrita que he grabado en mi vida y estoy muy contento que haya sido presentada a una nueva generación. 3. AMCU - Ud. ha grabado Pop, Rock, Gospel y Country. ¿Con cuál estilo musical se siente más cómodo? B. J. Thomas - Me siento muy cómodo en todos los géneros de música principalmente porque los encaro de la misma manera si la canción me llega emocional o personalmente. 4. AMCU - Uno de sus más recientes cds fue básicamente Bossa Nova y música con influencia brasilera. ¿Alguna vez ha cantado en Brazil? Si no es así ¿estaría interesado? ¿Cómo nació este proyecto? B. J. Thomas - Sí, he estado en Brasil varias veces y me gustaría ir nuevamente. El proyecto de Bossa Nova fue muy divertido. Amo ese estilo de música. 5. AMCU - ¿A quién citaría como su mayor influencia musical? B. J. Thomas - Hay muchas importantes influencias: Hank Williams, Elvis Presley y continúa con Bobby "Blue" Bland y los grandes cantantes de R&B e los 60s y 70s, Jackie Wilson, en particular. 6. AMCU - Como artista que ha grabado tantos estilos musicales ¿cuál disfruta escuchando? B. J. Thomas - Disfruto escuchando música clásica de los 60 y 70. Motown, Elvis, los Beatles. 7. AMCU - ¿Qué prefiere, Country Clásico o el Country de hoy? B. J. Thomas - Country Clásico porque cada artista tenía su estilo único mientras que hoy día hay mucha similitud en la música. 8. AMCU - Su primer éxito fue una canción de Hank Williams pero no ha sido la única canción de Williams que ha grabado. ¿Quiénes son sus compositores favoritos? B. J. Thomas - Hank Williams, Mark James (el compositor de Hooked on a Feeling), Barry Mann y Cynthia Wild, Burt Bacharach y Hal David y por supuesto, Lennon & McCartney. 9. AMCU - Tenemos entendido que su primer éxito con "I'm So Lonesome I Could Cry" de Hank Williams se originó porque su padre quería que Ud. grabara algo country y porque él había incluso conocido a Hank Williams. ¿Le gustó a su padre el resultado? B. J. Thomas - Sí, mi padre estuvo muy complacido y orgulloso con "I'm So Lonesome I Could Cry" porque fue un éxito Nº 1 en la zona de Houston, Texas y un Top 10 en las listas pop. Fue el comienzo de un larga carrera musical para mí. 10. AMCU - Ud. ha grabado a dúo con Ray Charles, Willie Nelson, Vince Gill, Lyle Lovett, etc. ¿Hay algún otro artista con quien le gustaría grabar una canción? B. J. Thomas - Sí, sería con Ana Carolina a quien escucho cuando viajo a Sudamérica y a quien considero una gran cantante. 11. AMCU - ¿Qué éxito de otro artista le hubiera gustado a Ud. haber grabado? B. J. Thomas - Demasiados para enumerar, hahaha! Hay muchas grandes canciones con las que hubiera encantado tener que ver. 12. AMCU - Muchos artistas masculinos con una carrera establecido se han unido con una artista femenina para grabar a dúo, por ejemplo, Kenny Rogers y Dottie West, Conway Twitty y Loretta Lynn o Kris Kristofferson con Rita Coolidge. Si Ud. tuviera la oportunidad de grabar un album con una artista femenina ¿a quién elegiría como compañera? B. J. Thomas - Marie Osmond. Marie es una maravillosa persona y una talentosa cantante. Somos amigos y pienso que un album a dúo sería muy divertido. 13. AMCU - Como cantante, Ud. ha ganado algunos de los más importantes premios en la industria musical, incluido el Oscar. Ud. ha estado en el top de la listas de ventas, ha escrito un par de libros, protagonizó una película y su voz y música han estado en comerciales. ¿Hay algo más que le gustaría hacer? 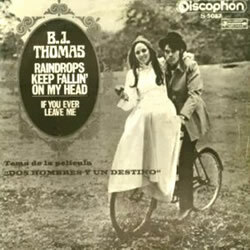 B. J. Thomas - Me encantaría tener la oportunidad de hacer vivir estas cosas otra vez, no reiterarlas, pero vivirlas. 14. AMCU - Su album "The Living Room Sessions" nos trajo nuevas, frescas versiones de sus clásicos. ¿A quién se le ocurrió esta idea? B. J. Thomas - Sandy Knox y Katie Gillion propusieron este proyecto y junto con los dúos hicieron que sonara muy interesante y resultó ser muy divertido. 1. AMCU - You have achieved worldwide fame but where would you say that the audiences have been more receptive to your music? B. J. Thomas - I have been very fortunate that all audiences have been receptive to my music. Having said that there is an energy in the South American audiences that I really enjoy and I always have a great time when I’m down there. 2. AMCU - Your classic song “Raindrops Keep Falling On My Head” has been prominently included on the soundstracks of both “Butch Cassidy & The Sundance Kid” and “Spiderman 2”. The latter introduced the song to a whole new generation. What is your reaction to this? B. J. Thomas - I am very pleased about it. Raindrops Keep Falling on my Head is the most well-written song I’ve ever recorded and I am very pleased it was introduced to a new generation. 3. AMCU - You have recorded Pop, Rock, Gospel and Country. Which musical genre do you feel more comfortable with? B. J. Thomas - I feel very comfortable in all genres of music mainly because I approach them in the same manner if the song touches me emotionally or personally. 4. AMCU - One of your most recent cds was basically Bossa Nova and Brazilian-influenced music. Have you ever played in Brazil. If not, would you be interested? How was this project born? B. J. Thomas - Yes, I have been to Brazil a number of times and would be excited about going again. The Bossa Nova project was a lot of fun. I love that style of music. 5. AMCU - Who can you cite as your major musical influence? 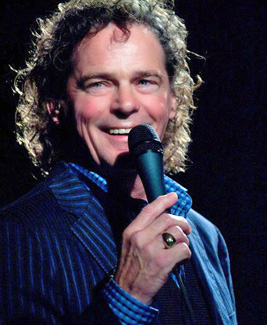 B. J. Thomas - There are a few major influences: Hank Williams, Elvis Presley and that continues through to Bobby “Blue” Bland and the great R&B singers of the 60s and 70s, Jackie Wilson, in particular. 6. AMCU - As an artist who has recorded so many styles of music, what to you enjoy listening to? B. J. Thomas - I enjoy listening to the classic music of the 60s and 70s. Motown, Elvis, the Beatles. 7. AMCU - What do you prefer, Classic Country or Today’s Country? B. J. Thomas - Classic Country because each artist had his own unique sound whereas today there is a lot of sameness to the music. 8. AMCU - Your first hit was a Hank Williams song but it has not been the only Williams song you recorded. Who are your favourite songwriters? B. J. Thomas - Hank Williams, Mark James (the writer of Hooked on a Feeling), Barry Mann and Cynthia Wild, Burt Bacharach and Hal David and of course, Lennon & McCartney. 9. AMCU - We understand that you had your first hit with Hank Williams’ “I’m So Lonesome I Could Cry” because your father told you to record something country and he had actually met Hank Williams. Did he like the result? B. J. Thomas - Yes, my dad was very pleased and proud of I’m So Lonesome I Could Cry as it became a Nº 1 hit in the Houston Texas area and a Top 10 on the pop chart. It was the beginning of a long musical career for me. 10. AMCU - You have recorded duets with Ray Charles, Willie Nelson, Vince Gill, Lyle Lovett, etc. Is there any other artist you would like to cut a song with? B. J. Thomas - Yes, it would be Ana Carolina who I hear when I travel to South America and whom I consider a great singer. 11. AMCU - Which hit by another artist do you wish you had recorded? B. J. Thomas - Too many to name, hahaha! There are many great songs I would have loved to be involved with. 12. AMCU - Many male artists with an established recording career teamed up with a female artist to record duets, for example, Kenny Rogers and Dottie West, Conway Twitty and Loretta Lynn or Kris Kristofferson and Rita Coolidge. If you had the chance to cut an album with a female artist, who would you choose as your partner? B. J. Thomas - Marie Osmond. Marie is a wonderful person and a talented singer. We are friends and I think a duet album would be a lot of fun. 13. AMCU - As a singer you have won some of the most important awards in the music industry, including an Oscar. You have topped the charts, written a couple of books, starred in a movie and your voice and music has been featured in commercial jingles. Is there anything else you would like to do? B. J. Thomas - I would love to have the opportunity to do all of these things again, not over but again. 14. AMCU - Your “The Living Room Sessions” album brought us new, fresh versions of your classics. Who came up with this idea? B. J. Thomas - Sandy Knox and Katie Gillion proposed this project and along with the duets made it sound very interesting and as it turned out it was a great deal of fun.